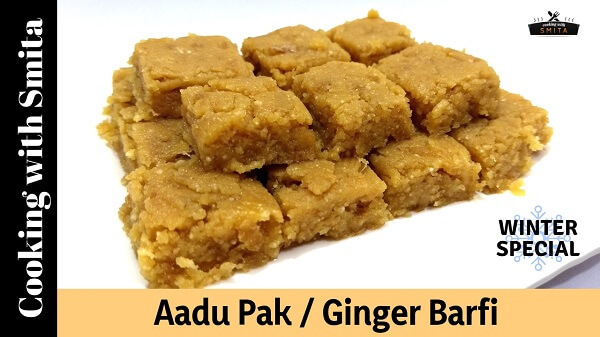 Aadu Pak also known as Ginger Pak or Adrak Ki Barfi – A must try Winter Special Healthy Recipe made from Fresh Ginger and Wheat Flour. Ginger has many health benefits too. Ginger is very beneficial in Cold problems and especially beneficial in throat infections. It is also suitable for children suffering from cold. Eat a small piece of Aadu Pak every day during the winter season will help to heal faster. Learn how to make Winter Special Recipe Aadu Pak at home with this step-by-step recipe guide. Wash, peel and grate ginger, keep aside into a bowl. Add 2 tablespoon ghee in a pan and heat on a medium flame. Add both the wheat flours in hot Ghee and cook for 5 – 7 minutes. Switch off the gas and shift the flour in a plate. In the same pan, heat 2 tbsp. Clarified Butter over medium flame. Add grated ginger and sauté for about 4 – 5 minutes on medium heat till golden brown. Switch off the gas and add cooked Ginger into cooked wheat flour. Now take a large pan/kadhai and add remaining Clarified butter, heat over medium flame. Add Jaggery, stir continuously until it melts. Add cooked wheat flour and Ginger, mix well. Shift the mixture into a plate. 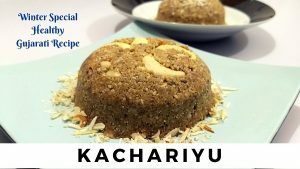 Gently press and spread Aadu Pak mixture evenly into the plate. Take a knife and cut into small size pieces while the mixture is still hot. Keep aside and allow it to cool down to room temperature. After cooling, store in airtight container and consume within 4 – 5 weeks.